BOSTON, May 20, 2013 — Technomad comes to InfoComm 2013 with new upgrades to its PowerChiton series of outdoor, weatherproof outdoor amplifier modules and breakout box accessories, giving end users and systems integrators more audio options for stadiums, resorts and other outdoor venues and facilities. 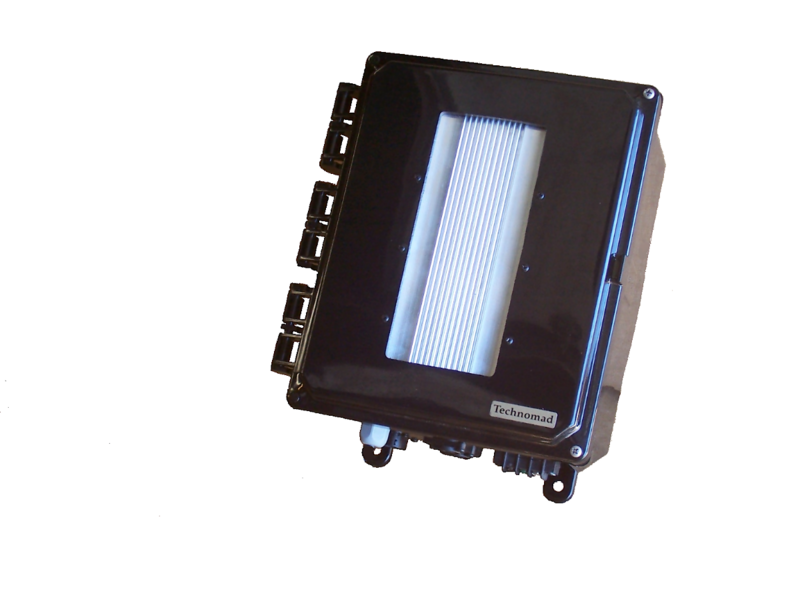 The compact and low profile of PowerChiton amplifier modules — available in four power levels up to 1600 watts — enables sound contractors to install the modules on light poles and other surfaces at any height for co-location with loudspeakers. A new balanced input provides customers with a choice of balanced and unbalanced connections, and three new integrated crossover filter options (350Hz high-pass, 85Hz high-pass, and 85Hz low-pass) allow installers to optimize amplifier performance for the assigned speakers. Filter options are selected or changed by moving the pre-amp-to-amplifier cable from one pre-amp output to another. 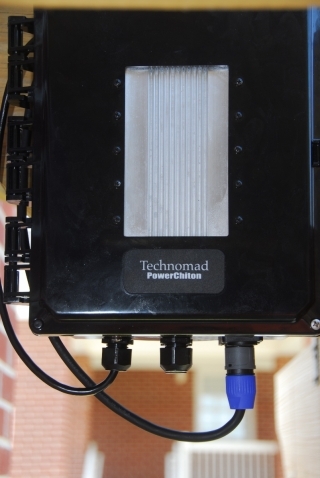 Technomad last year introduced the PowerChiton BreakoutBox, a companion product that enables local audio control at user-friendly locations in the same NEMA-style protective enclosure. Contractors wire the PowerChiton amplifier modules direct to the BreakoutBox, typically installed at eye level so end users can adjust volume and connect devices on the fly. This year, Technomad introduces BreakoutBox XL, a deeper enclosure offering three expansion bays for use with up to three Technomad wireless microphones and/or custom Technomad Schedulon master audio playout systems. The BreakoutBox XL offers extra storage space so end users can lock and leave devices following an event, and adds a mic/balanced line input channel that combines into a single jack. Technomad will also demonstrate PowerChiton-integrated Apple AirPlay capability for iOS devices. This allows commercial and residential customers to wirelessly stream iTunes audio files and playlists to any iOS device in range within a PowerChiton amplifier or breakout box, reducing costs and infrastructure associated with traditional wiring and cabling. Technomad will also show the latest design upgrades to its advanced audio loudspeakers, notably redesigned ports to its popular Noho model to enhance bass response. The new design reduces port compression and turbulence at higher SPL levels, and provides low-frequency output of +3dB at 85Hz. Noho loudspeakers are available standalone or as part of complete Technomad Turnkey PA System with a powered amplifier, six-channel mixer, microphones, cables and more in a 6RU protective equipment rack. Mounting options include outdoor yoke mounts to simplify hanging, and Technomad’s recently-introduced stainless steel mount. Both are specifically built to survive long-term outdoor conditions, with the stainless steel mount able to tightly lock in Technomad loudspeakers from multiple fly points. Technomad will exhibit this year at Booth 513. InfoComm 2013 takes place June 12-14 at the Orange County Exhibition Center in Orlando. Technomad LLC, founded in 1995, designs and manufactures loudspeaker systems for the professional audio and security/military technology industries. The company invented the first reliable full-range weatherproof loudspeaker and now offers nine models ranging in power from 60-watt loudspeakers to 1250-watt subwoofers — most available in Turnkey PA System packages featuring amplifiers, mixers and other signal processing equipment in pre-wired racks. The company also manufactures a variety of audio infrastructure and communications equipment including playback and recording systems, weatherproof power amplifiers and turnkey remote audio systems. Contact Technomad at 617-275-8898 or visit http://www.technomad.com for more information.